The rugged and reliable KingQuad 500AXi Camo receives a few new changes that provides smoother acceleration, quicker throttle response, and a stronger feel in the mid-high RPM range. The front end of the quad gets a newer aggressive stance while side panel change allows you to easily check your oil level without removing any body parts. For three decades, Suzuki literally invented the 4-wheel ATV. The Original Suzuki LT-125 established Suzuki as the First On 4-Wheels. The Suzuki KingQuad 500AXi Camo carries on the tradition of performance that rules. Boasting the same advanced technology as the extraordinary KingQuad 750AXi Camo, it's engineered to help you cut the work day down to size - or conquer the toughest trails. The KingQuad 500AXi Camo offers plenty of class-leading features and its fuel-injected 493 cc engine gives it exceptional performance. Independent double A-arm front suspension (7.1 in. of wheel travel) includes large diameter shock absorbers with 5-way spring preload adjustment. Fully independent, A-arm / I-beam rear suspension with long suspension travel (7.9 in. of wheel travel), includes large diameter shock absorbers with 5-way spring preload adjustment and large diameter rear sway-bar. 25-in. tires come mounted on heavy-duty steel wheels. A powerful 493 cc, SOHC, single-cylinder, liquid-cooled, four-stroke engine was designed for a wide powerband with strong top-end power. Its cylinder is canted forward for a lower center of gravity, reduced engine height and lower seat height. The engine also features a counterbalancer shaft for smooth operation. The KingQuad 500AXi has a compact 4-valve cylinder head with large intake valves and straight intake ports for increased cylinder charging efficiency. A sportbike-derived chain-and-gear camshaft drive system allows a short / narrow cylinder head design and reduced overall engine height. 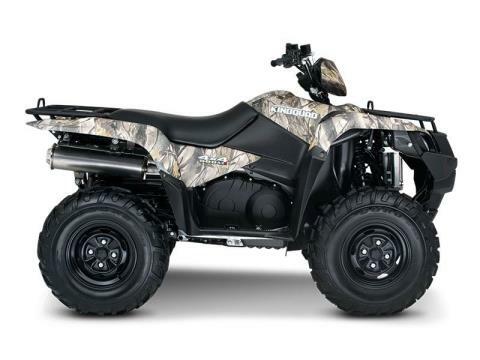 The KingQuad 500AXi comes with a QuadMatic™ CVT-type automatic transmission designed for maximum versatility and convenience with a fender-mounted gate-type shifter operation for high / low. Its advanced engine-braking system minimizes free-wheeling with the throttle off and helps control the vehicle during steep descents. Digital instrumentation includes LCD readouts for speedometer, odometer, twin tripmeters, hour meter, clock, fuel gauge, driving range position and drive mode. LED indicator lamps for high, low, neutral, reverse and drive—2WD / 4WD and differential-locked 4WD. LED indicator lamps for fuel injection and engine temperature. A high output magneto generator system and large 18 amp maintenance-free battery provides extra power. The KingQuad 500AXi comes with a large 4.6 gal. fuel tank, positioned for a low center-of-gravity. It includes a vacuum-operated petcock, ratchet-style fuel cap and convenient bar-type fuel gauge. A large 2.8 liter water resistant front storage compartment includes new easy-to-open / close screw-on cap.